Found a bag of 16 white plastic eggs cups at the thrift store. I decided to link them together and make them into a chain with garden jute twine. Tied the ends to the glass door handles so I could decide what to add. 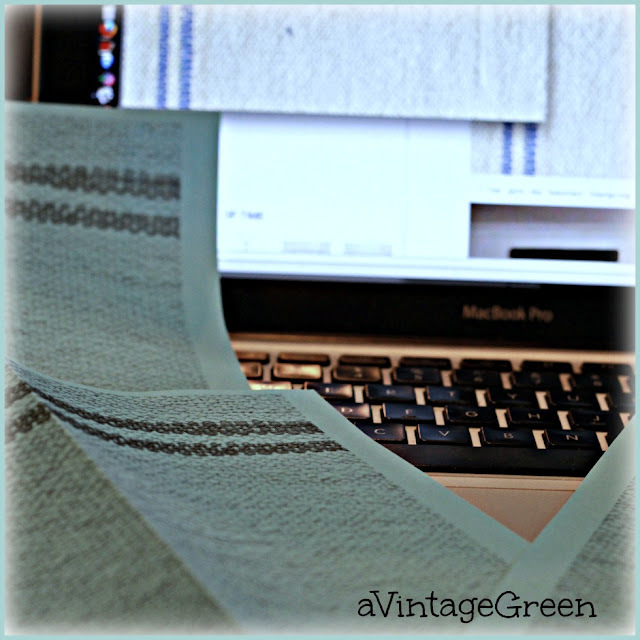 Visited Knick of Time and dragged a copy of her grain sack printout to my desktop, opened it with Preview (Mac Computer) and printed 3 copies on turquoise paper. Used A E R S T from my Staples Stencil pack. 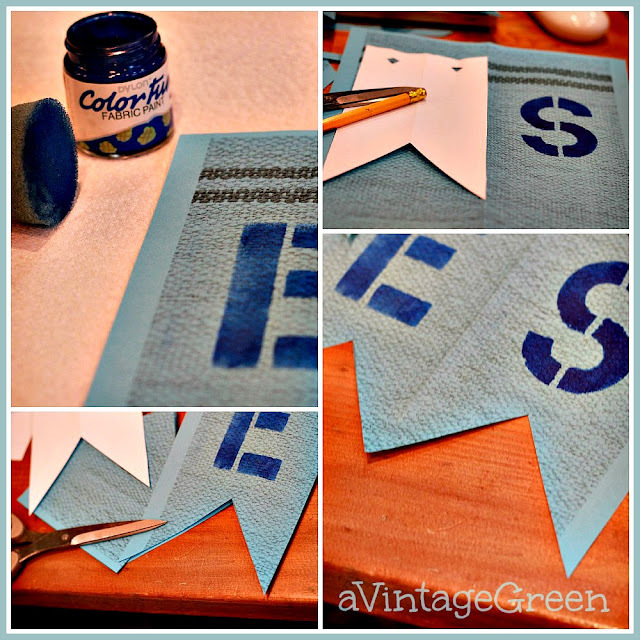 Decided on spacing, pattern, placement and then added paint inside each stencil letter. Traced my pattern, cut out the individual letters, folded over the top edge to make a stronger edge for threading the jute twine, punched out some holes and threaded the banner. After getting this far in the process I can see that there are many variations that could be added. 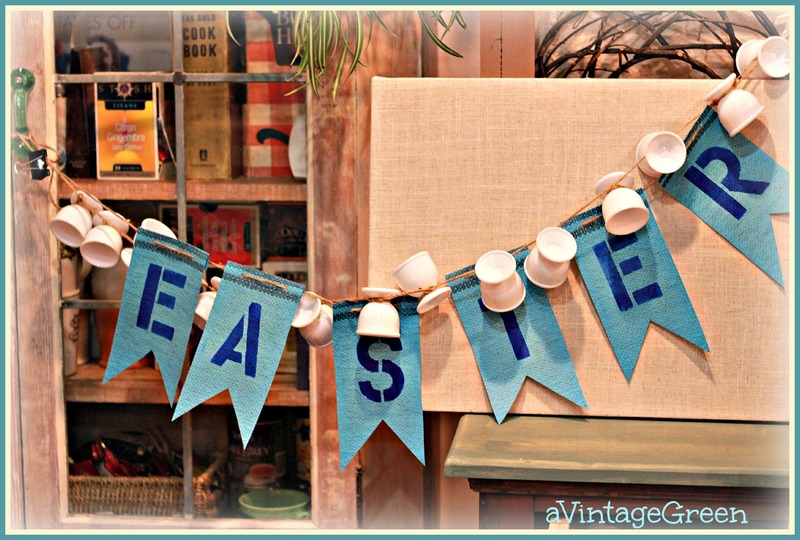 Since the letters are separate from the egg cups changes will be easy to do. Banner so far. Tempting to add some bits of pink and lace. 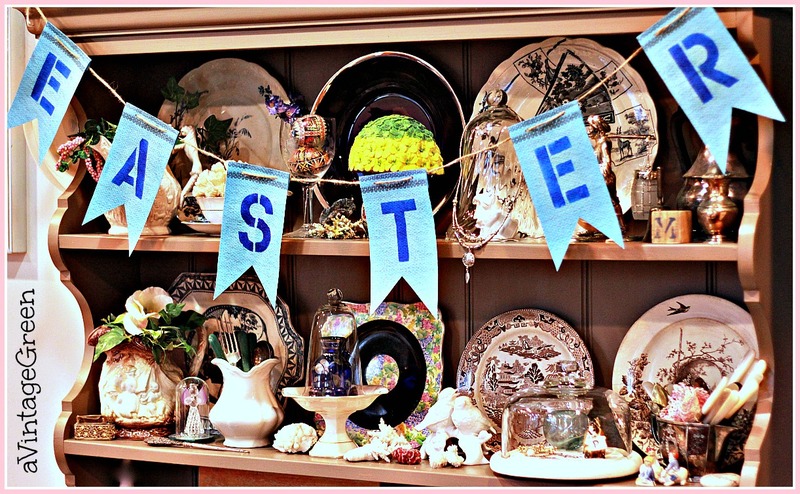 Decided to add the Easter part of the banner to my Spring Mantel. The egg cups blocked the shelves so I left them off. BTW the egg cups make a great 'chime' when hung on a hook or from a window frame. 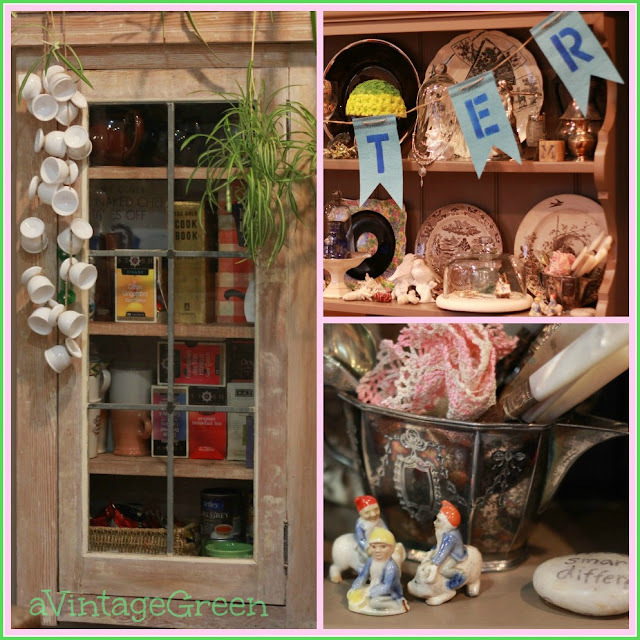 Added some tiny Elf/Leprechauns (saved from my Mom's miniature garden decorating collection - so they are my 'favorites' this week) and a pink and white doily to my Spring Mantel. Here too is a view of the egg cups repurposed as a chime (hanging from my Tea Cupboard). Thanks again to Angie at Knick of Thyme for her grain sack printout. good morning Joy ... Really cute banner. I am not too much for doing banners, but some of them are so cute. Cute banner. Love the egg cups hanging all together. super cute! I may have to make one for the booth! Oh that's so sweet. A different way to use the egg cups. How fun is that! 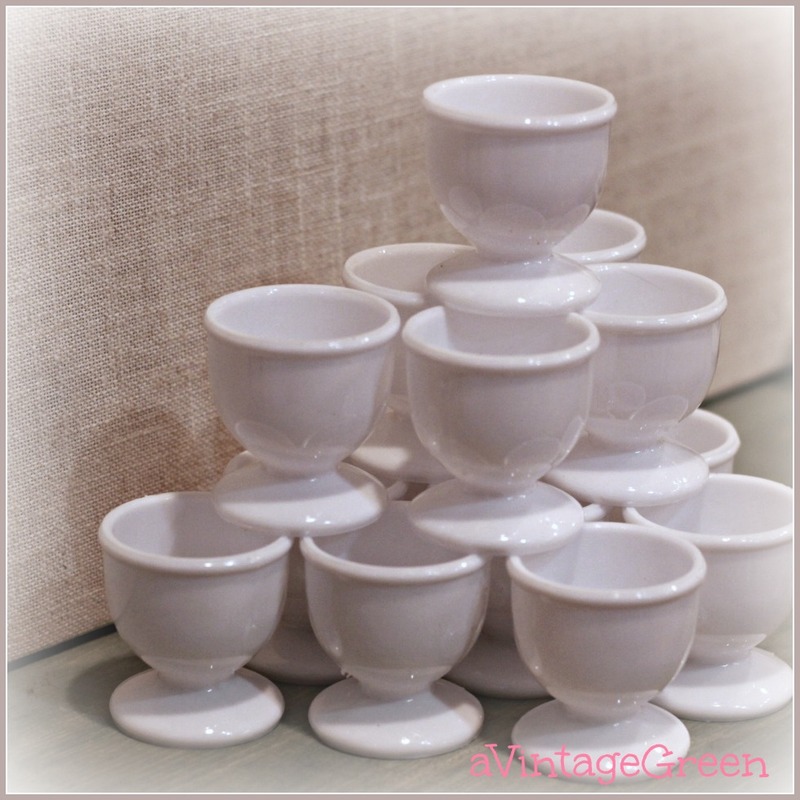 What a cute idea for usihg the plastic egg cups! Thank you for sharing at TTF. Have a Happy St. Patrick's Day! Great find - even greater thanks to your efforts and creativity! 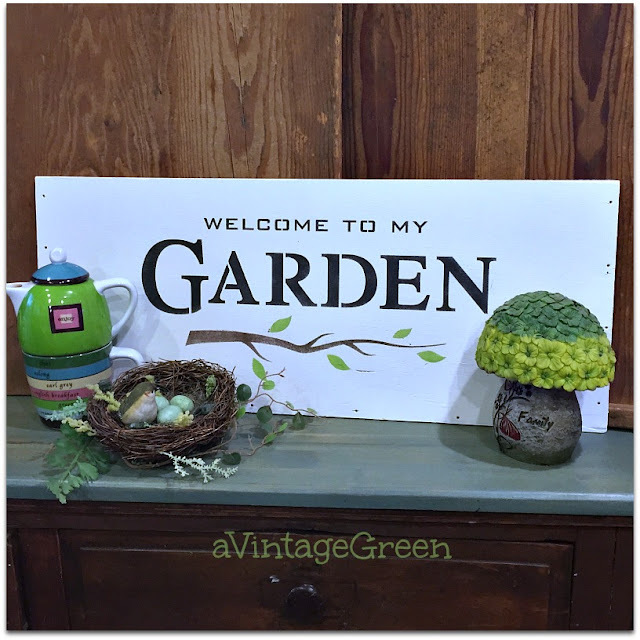 Love the banner hanging across your hutch. Your plates and other pieces are beautiful and displayed so well. Love your banner, Joy! What an inventive and charming addition to your home. The use of the egg cups is brilliant! Also love those pieces that were your mom's. They are so sweet! Very cute and creative Easter banner! Awesome! I love all the variations. The cups remind me of bluebells and cockle shells...isn't that a poem somewhere? Very good for spring! Love the grain sack print out Joy. Perfect in turquoise. 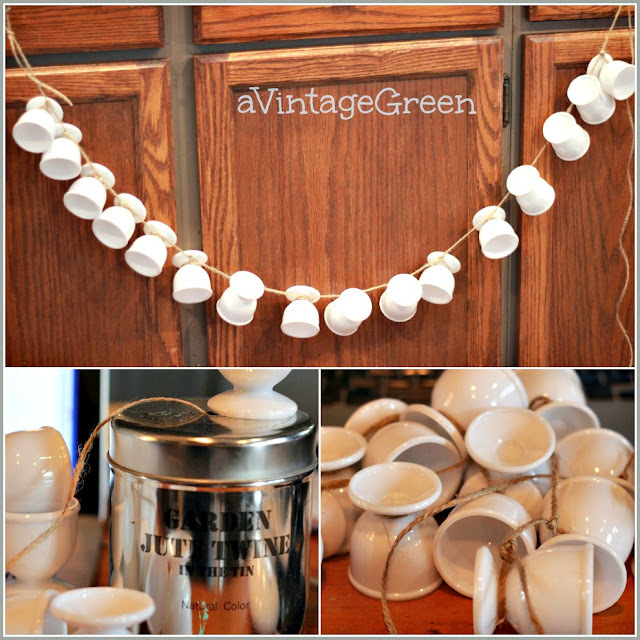 Clever idea to use the egg cups as a wind chime. Thanks for sharing with SYC. 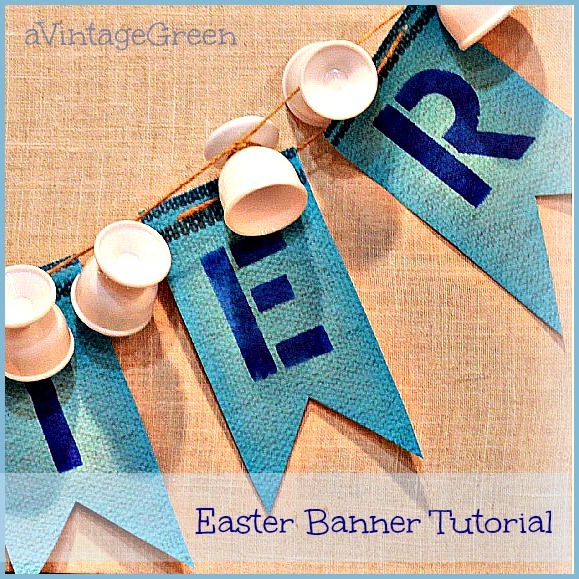 Your banner is darling and what you did with the plastic egg cups is fabulous! Thanks for sharing your creativity with Roses of Inspiration. Hugs! Good morning, dear Joy! Just wanted to pop in and let you know this post has been featured at Roses of Inspiration :) Thank you for linking up last week! Hugs!